You are out in the woods alone, (this is not advised) and you have nothing but your survival knife to assist you with all of your basic needs to survive. You build a shelter, start a fire and kill a deer to eat. The next morning you hike out and find civilization once again. Then you live to be 100 years old telling this story many more times than you have years and the story only gets better each time. Of course, this is the story we all want to tell our kids, grandkids, great-grandkids and everyone else kind enough to listen. You only have one problem: you bought a crappy knife and died. The end. This is not as good of a story as the first, and it all starts (and ends) with the knife. The above (simple) story illustrates the importance of buying a quality knife for all of your survival needs. Below I’ve listed five survival knives…my personal favorites, and the ones I would trust to take with me into any situation. The KA-BAR Serrated Edge knife is a great choice in terms of survival knives. I always like to look at a few aspects of a knife when I’m looking at buying one. The first thing is durability. This knife is very durable, I have read hundreds of reviews on the KA-BAR website, as well as Amazon, where a lot of people have been very pleasantly surprised because their knife has lasted so long and held up so well. Customers have said that they have been able to use their KA-BAR to split wood, pry things open and cut through animal bone. No matter what you use this knife for, it will hold up well. 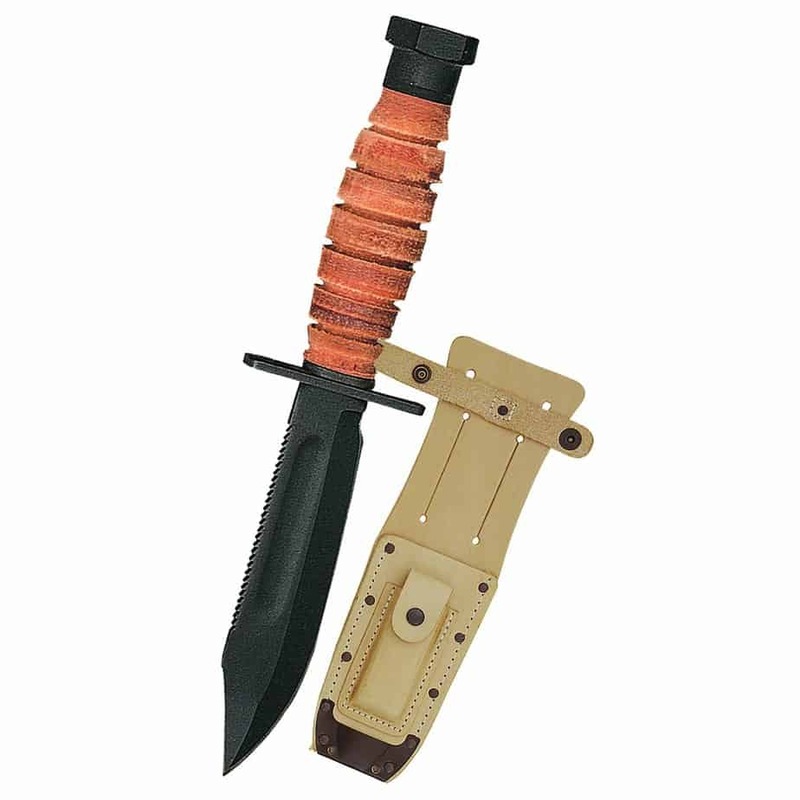 The blade of the KA-BAR is 7 inches of 1095 Cro-Van steel. This type of steel is a good quality, easy to sharpen carbon steel. It’s also popular in most KA-BAR knives. Others who have reviewed this knife have also said that the edge of the blade on the KA-BAR held up very well. Another said that the blade is made from a thick steel and that it is a full tang construction. The edge angle on the blade is the common 20 degrees. Overall the blade and sharpness are exactly what I would expect from KA-BAR. One great feature of this model is the half serrated blade. It allows for many more uses than just a knife with a regular blade. For example, as one reviewer said, “the serrations provide added utility, namely the ability to craft feather curls (a type of wood shaving) for building a campfire”. The handle is a man-made Kraton G handle made to fit comfortably in the hands (right or left) of the user. Kraton G is a synthetic rubber, so it has that texture of a hard rubber, which is great for increased grip. The whole knife measures 11.75 inches with 4.75 inches being the handle length. This ensures that the handle is large enough for most users to operate the knife comfortably. Check out this link to find the price of the KA-BAR Fighting/Utility Serrated Edge Knife on Amazon! This is my second choice; it’s pretty close to the KA-BAR but it didn’t quite make the cut for first place. Let’s check the details and see exactly how it performs. The Schrade SCHF9 is a fixed blade knife that is known as a workhorse among knives. It has a 1/4 in thick, full tang blade that handles virtually any job. Out of the hundreds of great reviews this knife has received on Amazon, almost everyone was impressed by the beefy bulky features that make it durable. Similar to the KA-BAR, this knife’s blade is made out of 1095 carbon steel. The blade is full tang giving the extra strength through the handle. This knife also has the ability to hold an edge. It comes pre-sharpened, which means when it arrives it is ready for all of your survival adventures. The actual exposed blade length is 6.4 inches. When you hold the Schrade SCHF9, you’ll notice it has an impressive functional handle that is meant to fit the contours of your hand as well as aid you in maintaining your grip. This is accomplished by making the handle out of Kraton, the synthetic rubber. The handle is 5.6 inches and will fit most sizes of hands. The handle and the blade are pretty close in length making it a well-balanced knife. 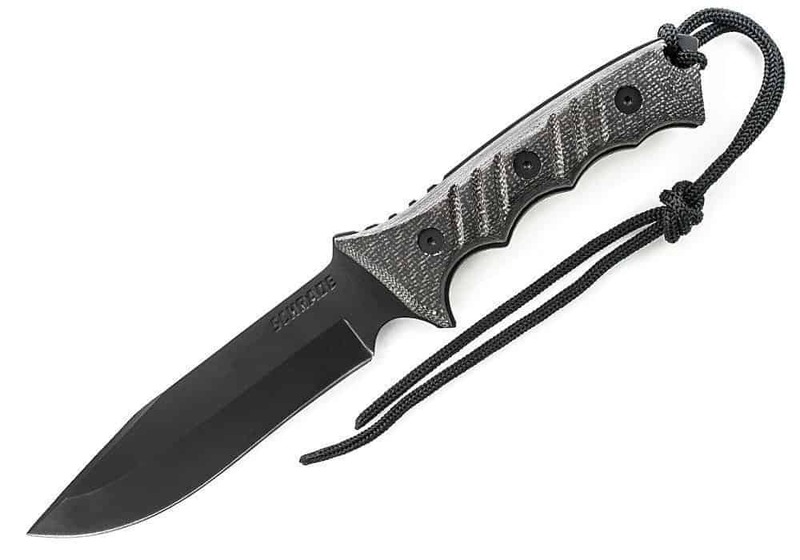 Check this link to find the price of the Schrade SCHF9 Extreme Survival Knife on Amazon! The Ontario 499 fell in the third place spot. It is a military issued knife, so it’s a little smaller for convenience. It’s also a little different than the first two, so let’s unpack this hard working blade a little more for a closer look. The Ontario 499 knife is a durable blade issued to the US Air Force and, thankfully for us, is also available to the public. One thing that makes this blade a little different from the others is the fact that it is Parkerized. When a blade is Parkerized it has a chemical phosphate coating adhered to it to protect the steel and reduce the amount of corrosion. It also increases the resistance to wear. The Ontario 499 comes with this feature because it is military issue. On the back end of the handle is a sturdy butcap which can be useful for hammering and pounding things. This blade is made out of 1095 carbon steel like the others…which means as far as blade strength is concerned, it’s strong. The 1095 carbon steel can hold an edge very well depending on how it is used. That being said, you can always resharpen a knife. On the back of this blade, you’ll find small serrated teeth, not for sawing but for notching. This can come in handy when making traps or notches in trees. The blade length is 5 inches. It is a little smaller in comparison but it is a great option for something more compact. The handle on this knife is made of natural leather. This gives it a more rugged look and it also provides a good grip for the user. The handle is 4.5 inches which is a good size in comparison to the 5-inch blade. It allows for precise control and accuracy. Check this link for the price of the Ontario 499 Air Force Survival Knife on Amazon! 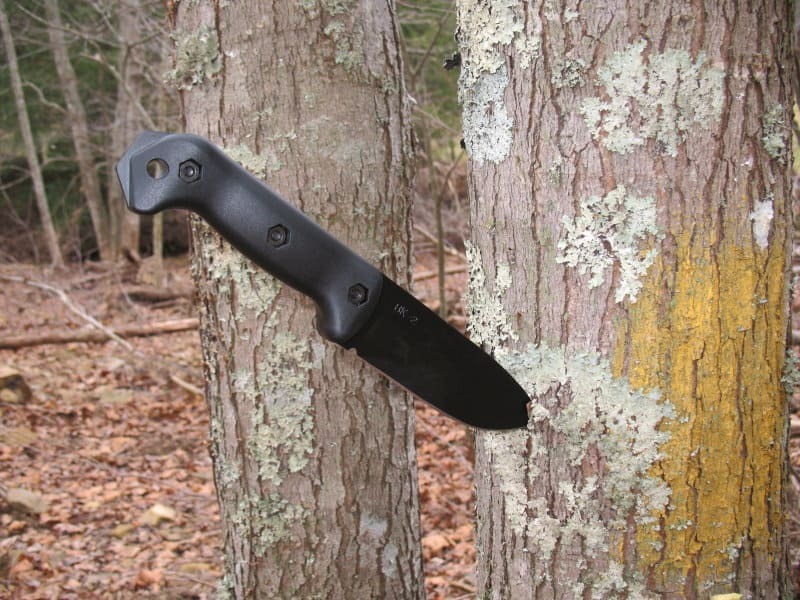 The Schrade SCHF3N is a survival knife that was made for intense outdoor activities. Its blade is a full tang blade giving it predictable and impressive durability. The handle is made out of Micarta, a composite material made from plastic resin and layers of cloth – this equates to a blade that will stand the test of time. Depending on the tasks performed with this knife, it will more than likely outlast you. 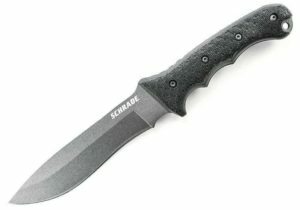 The blade on the Schrade SCHF3N is made out of 8Cr13MoV high carbon stainless steel. This type of steel is Chinese made. It is of decent quality, but it is not the best. It is comparable to the Aus-8 Japanese made steel as well as the 440b stainless steel that contains 0.9% carbon. It can hold an edge but will more than likely need to be sharpened more often. The handle of this knife is made from Micarta. Micarta is a material that is made in a very specific way. It is layers of linen cloths that are soaked in phenolic resin. The end product is a material that is extremely smooth, durable and lightweight. These factors make it a prime material for knife handles. The handle has smooth molded grooves to comfortably fit into your hands. Check this link for the price of the Schrade SCHF3N Extreme Survival Fixed Blade Knife on Amazon! Our number 5 pick is the SOG Fo3T-N Jungle primitive. 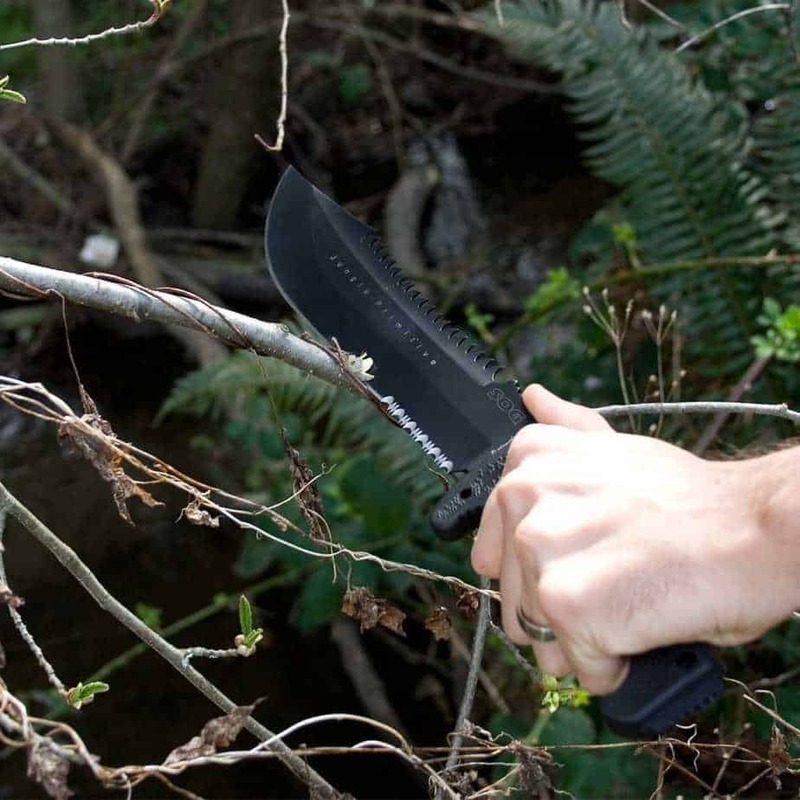 This blade is a versatile, military-grade mini-machete. SOG originally stood for Studies and Observation Group, an elite joint services military group designed to handle covert operations during the Vietnam War. 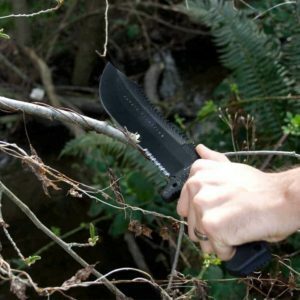 This monster of a knife has the look of a true survivor knife and, according to the hundreds of happy people who have purchased it, is very well built and feels exceptionally sturdy when in operation. The Jungle Primitive has a few different edges on it giving you options for use. With even usage of each blade, you will reduce wear on one side which equates to a longer life. The blade on this knife is made out of the 8Cr13MoV high carbon stainless steel. This steel is a good quality steel, but it may require more frequent sharpening. The blade length is 9.5 inches. The long length of the blade enables a longer reach and more momentum during the swinging motion. The blade thickness is 0.15 inches giving it guaranteed strength. The handle is approx. 5.8 inches long. It is made out of Kraton. The length of the handle coupled with its tough and rugged construction makes ita great choice for survival purposes. It has a comfortable, rubbery grip and plenty of room for your whole hand. It also has slip protectors at the top and bottom of the handle, ensuring safety for the user. In the end, these knives are close competitors in all of the “judged” categories. Another feature I didn’t mention above is that all of these knives are in a very close price range, which means affordability. I always do my knife shopping online at Amazon due to the fact that they can offer the best prices. Another great thing about Amazon is that you can trust them. Follow the links to Amazon to purchase any of these five great knives or even just to check out the prices, but hurry, the prices may go up at any time! Happy knife shopping!! What did I miss? Leave me some feedback! Just wondering if these are knives you’ve t&e yourself or if you’re just ranking them based on Amazon and other types of reviews? I’m seriously not saying this in a snarky way it just isn’t clear from the article. Great article. Interesting choices. I’ve been collecting knives for 34 years (by no means a “expert” of any type) and used two of the knives listed during my 20 years in the U.S. Army. K-bar is an excellent knife and I unfortunately saw the end results of it’s cutting ability in an accident with two soldiers. The USAF Pilot’s Survival Knife is okay and I have not tried the SOG knife that was also listed. I haven’t met anyone yet that has the two Schrade knives that were listed, but was wondering if I was the only one that noticed that they are “affordable” copies of the Boker Dive Knife and Chris Reeve knives. Just wondering how they fare, compared to their original counterparts? The above statement is my “humble” opinion.